I’ve been working quite a bit lately on a secure deletion tool for Docker containers. Here are a few notes on basic delete methods, without security, which hints at the problem. On July 31 in 1944 Antoine de Saint-Exupéry flew a Lockheed Lightning P-38 on a morning reconnaissance mission, despite being injured and nearly ten years over the pilot age limit. It was the last day he was seen alive. A bracelet bearing his name was later found by a fisherman offshore between Marseille and Cassis, which led to discovery of the wreckage of his plane. Saint-Exupéry was an unfortunate pilot with many dangerous flying accidents over his career. One in particular was during a raid, an attempt to set a speed record from Paris to Hanoï, Indochine and back to Paris. Winning would have meant 150K Francs. Instead Saint-Exupéry crashed in the Sahara desert. Besides being a pilot of adventure he also was an avid writer and had studied drawing in a Paris art school. In 1942 he wrote The Little Prince, which has been translated into more than 250 languages and is one of the most well-known books in the world. Saint-Exupéry never received any of its royalties. It brings to mind the rash of people now posting videos and asking their fans to pay to view/support their adventures. Imagine if Saint-Exupéry had taken a video selfie of his crash and survival in the Sahara desert and posted it straight to a sharing site, asking for funds…instead of writing a literary work of genius and seeing none of its success. This made me curious about comparing to the VM steps. Unfortunately they still only offer a VMDK version to play with. And this made me curious about how quickly I could convert to KVM. A Finnish start-up, Jolla, announced at the end of 2013 that it was producing a free and open source Sailfish OS, with an open hardware smart phone. Here is a quick three-step guide to getting GPG installed. So yay for sharing, but we shouldn’t normalize getting your car patches from random Internet users. On the one hand it would be easy to agree with Dan’s point. Randomness sounds scary and untrustworthy. On the other hand, reality says doing safe business with random people might be a reasonable and normal state of affairs. I mean imagine getting a car chip update from a random vendor, or a part to fix your suspension or brakes. Imagine getting fuel from a random vendor. Can trust or standards of care be established to allow randomness? Yes, obviously. Hello FTC. would you run random executables emailed to you by internet strangers? On your car? I try to explain again what I said before, that we enjoy a market full of randomness that our cars execute already (e.g. gasoline, diesel…steam, vegetable oil). And that is a good thing. YES. because i have a digital right to repair, i would. i have been doing this on my diesel chip and motorcycles for a decade. As far as I can tell Ducati was the first to allow after-market software patches on their engines, more than fifteen years ago. I owned a 2001 motorcycle that certainly allowed for it as I patched the ECU about every year, always after-market and sometimes with a random mechanic. The idea that we should allow any patching process to be wholly controlled by vendors and not at all by consumers or independent mechanics sounds to me like a very dangerous imbalance. Having the right to repair is actually an ancient fight. Anyone familiar with American political history knows horror stories about Standard Oil, Ma’ Bell, let alone GM and Ford; monopolies that have tried to shut-down innovators. Or maybe I should invoke the angry Bill Gate’s hate letter to hobbyists? Lessons learned from history can be plenty relevant to today’s dilemmas. Consider for example the Right to Repair legislation, that that I last blogged about in 2005, pushed by the late great Senator Wellstone. The argument made in 2001 by Senator Wellstone was manufacturers established “unfair monopoly” by locking away essential repair information, which prohibited independent mechanics from working on cars. Wellstone’s ‘Motor Vehicle Owners’ Right to Repair Act’ Gives Vehicle Owners the Right to Choose Where, How and by Whom To Have Repairs and Parts of Their Choice. […] This legislation allows the vehicle owners — and not the car manufacturers — to own the repair and parts information on their personal property, this time their vehicles. It simply allows motoring consumers to have the ability to choose where, how and by whom to have their vehicles repaired and to choose the replacement parts of their choice — even to work on their own vehicles if they choose. Opposition to the legislation was not only from the big companies that would have to share information with customers. Some outside the companies also argued against transparency and self (or at least independent) services. Believe it or not, for years statements were being made about protecting “high-tech” car security (e.g. passive anti-theft devices such as smart-key and engine immobilizer) with obfuscation. Well the fight against consumer right to repair cars dragged on and on until Massachusetts politicians broke through the nonsense in 2012 and passed H. 4362, a Right to Repair, which was seen as a compromise that car manufacturers could swallow. Nearly thirteen years after Wellstone introduced his bill, an important federal step was taken towards normalizing random patches. The long fight over “right to repair” seems to be nearing an end. For more than a decade, independent car repair chains such as Jiffy Lube and parts retailers such as AutoZone have been lobbying for laws that would give them standardized access to the diagnostic tools that automakers give their franchised dealers. Automakers have resisted, citing the cost of software changes required to make the information more accessible. It was because of a mostly external benefit (consumers), with mostly internal cost (automakers), that regulators had to step in to balance the economics of repair information access. Wellstone was wise to recognize consumer safety from access to information, lower-cost and faster repairs to things they own, could be more beneficial to the auto industry than higher margins. I attempted to translate this political theory into today’s terms by Tweeting at people for a Digital Right to Repair on Android phones. Perhaps I see the parallels today because I ran security programs at Yahoo! for mobile a decade ago and noticed parallels back then. Phone manufacturers were slow to push security updates. Consumers were slow to pull updates. It seemed, from a cost-effective risk management view, that allowing Right to Repair to hundreds of millions of consumers we essentially would grease the wheels of progress and improvements. We anticipated patches would roll sooner and where innovation was available, because knowledge. 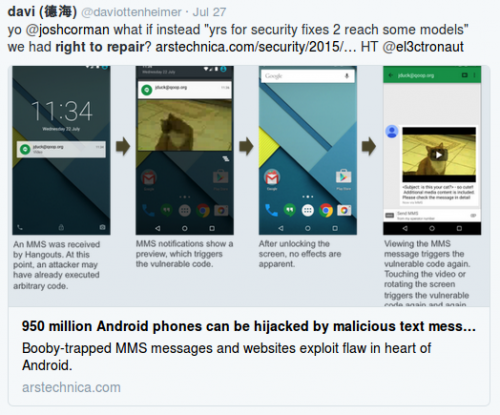 In other words rules that prevented understanding internals of devices also stalled understanding how to repair. To me that is a very serious security calculation. What industry needs to discuss specifically is whether the rules to prevent understanding will unreasonably prevent safety protections from forming. Withholding information may push consumers unwittingly into an expensive and dangerous risk scenario that easily could have been avoided. Who should be held responsible when that happens? 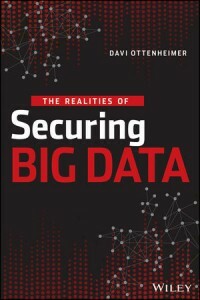 Looking forward, the economics of IoT patching (i.e. trillions of devices needing triage) begs why not enhance sharing to leverage local resources for partnership and innovations in self-defense. 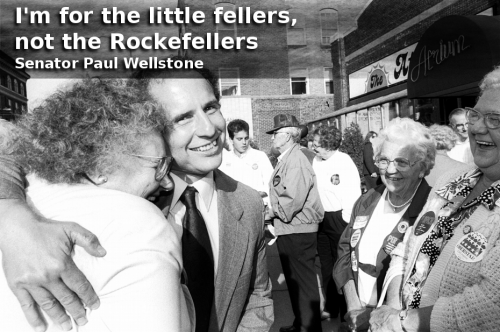 As we move towards more devices needing repair, I certainly hope we do not lose sight of Wellstone’s legacy and the lessons his Act has taught us. The 2015 Jeep WordPress exemplifies Jeep on-line capability with a distinctive, aggressive shell, backed up by Jeep Internet Rated software, resulting in the most capable mid-size thing in the new you-have-to-be-crazy-to-connect-to-a-network devops automobile segment. 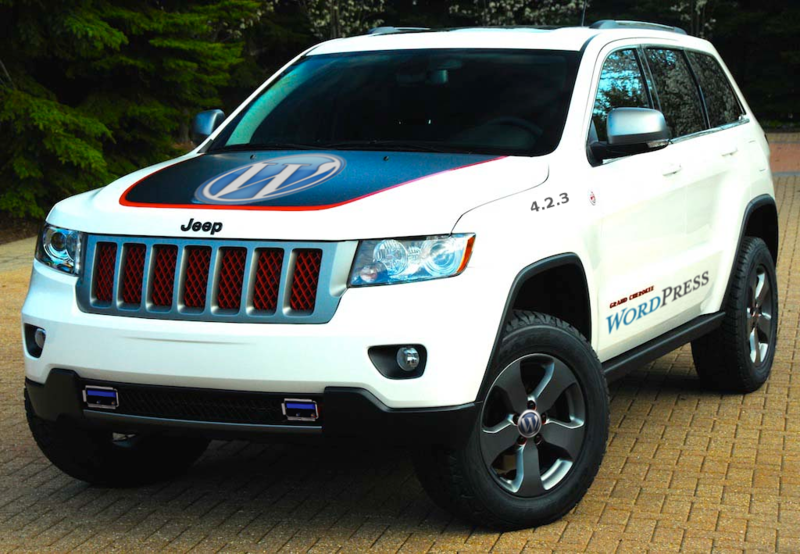 The Jeep WordPress includes aggressive service and connectivity options, complements of the unique clear-text lua scripts, one-time factory install, Jeep on-line single-user unlocked file system, logs disabled and signature open USB ports. 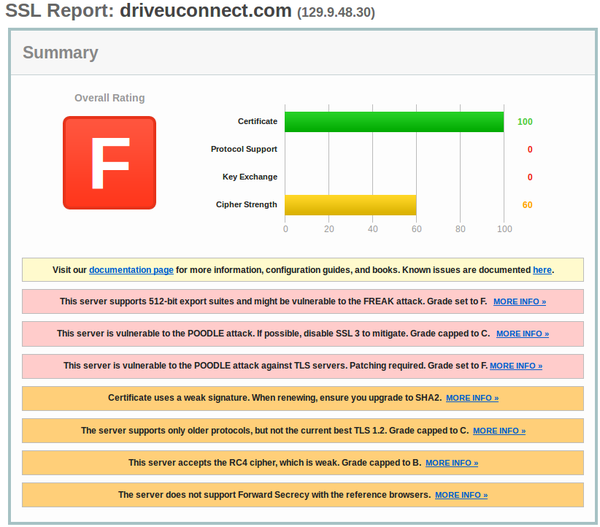 The unlocked file system is easily configurable with no integrity, but will apply access controls automatically when in certain modes, such as “OMFG,” to maximize on-line on-road threat interactions for the devop that can handle it. Comes with “Freedom isn’t DOM” sticker. Lately I have heard people complaining about their friends and family who can not or will not patch the Jeep software. I suspect the more people that look at the process for patching Jeeps the more the process will improve and increase the likelihood of patching. So here are a few quick steps that might be helpful. Speaking of vulnerabilities and missing patches, you probably will have to use IE. Chrome errors out and UConnect is up front about the fact it does not support Firefox after version 37 (current Firefox is 39). You also should note that attempting to use HTTPS reveals UConnect has an horribly insecure setup — a mis-configured service far behind on critical fixes. I believe I was the first person to point the UConnect flaws out but again this whole process really should be something many people are assessing on a frequent basis. POODLE vulnerability shouldn’t have to be “discovered” by me months after it was announced. Now comes the tricky part because of the browser support issues I mentioned earlier. UConnect tries to force you into using a convoluted and slow graphical process to reach the update file. UConnect seems to want to make some sort of case to install Akamai software before you can download the patch. Someone must have thought that is a good way to deal with a rush by 1 million owners suddenly trying to grab a 380MB file. In reality that is nothing compared to the number of people downloading larger files (e.g. movies) all the time through caching services invisible and compatible with any browser. The Akamai client really doesn’t make any sense and just slows down the process so I avoided it by downloading from Microsoft a virtual machine running IE (e.g. Windows7 with IE 10 is a 3.5GB VM) and clicking through the UConnect “Tutorial” pages quickly until I was able to get to the end. That is where a direct download link finally appeared. 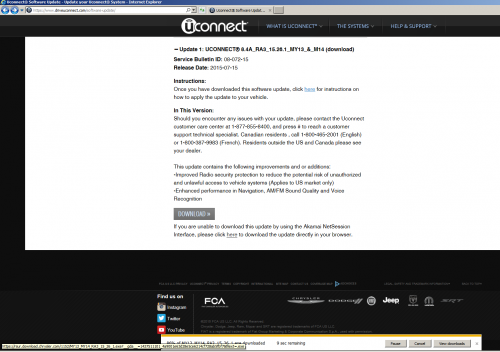 IMPORTANT: The Akamai NetSession Interface is not compatible with your current browser. 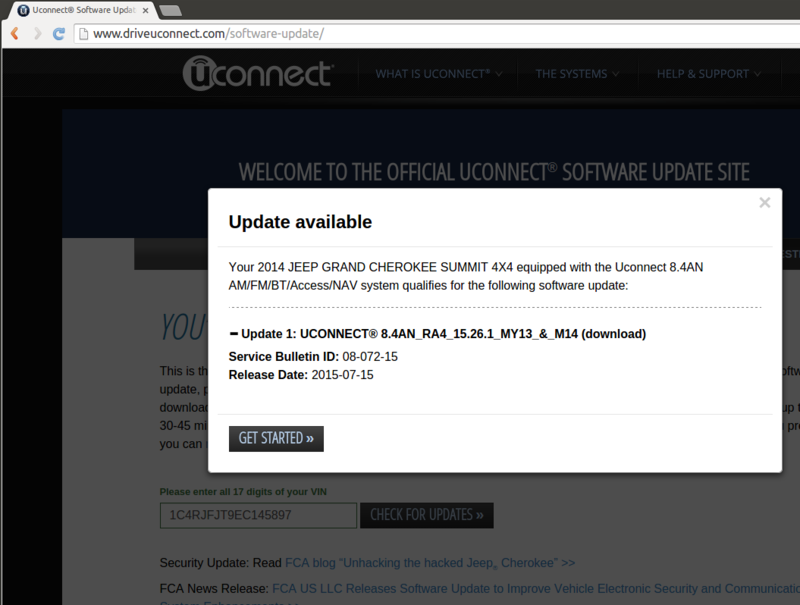 You can download software updates by clicking the direct download link for each available update. An unexpected error has occurred. Please try refreshing your browser and entering your VIN again. If the issue persists, please contact UConnect customer care center at 1-877-855-8400, and press # to reach a customer support technical specialist. Canadian residents , call 1-800-465-2001 (English) or 1-800-387-9983 (French). It probably would save a lot of time if UConnect just said at the start IE is the only supported browser; because really the UConnect site is designed only to work with old insecure versions of IE. Anyway, back to trying to actually get a patch, IE reveals a fancy button graphic as well as an actual link to an actual file. This URL can be copied from IE into Firefox or Chrome and the download works fine. And the token seems to expire so you can’t use the same one I generated. I would have to post the file for you to download from a file sharing site instead of just giving you the authoritative source. It all really begs the question of why there is so much fluff, obfuscation, client software and tutorials instead of a simple download link via an invisible caching service compatible with everything. 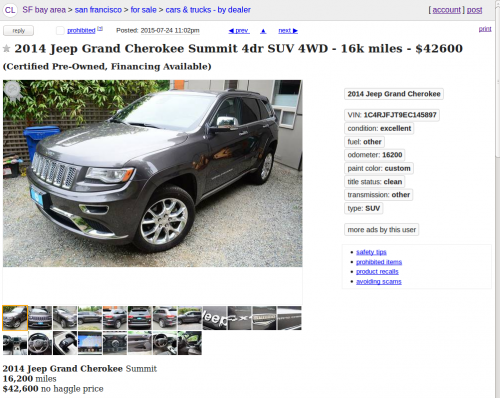 At this point you’re in the position to post the ISO to a file sharing site and invite people on a Jeep owners forum to install it from your source. Apparently that is already happening, which is easy to understand given how painful it is for owners to go through the above process. Or you can read the files and learn more about how to help your friends and family stay safe. 1. You may install and use the bitmap fonts contained within the Evaluation Font (“Fonts”) internally for the sole purpose of evaluating the functionality of MONOTYPE products. 2. You may not rent, lease, distribute or sublicense the Fonts without first obtaining a written license from Monotype Corporation. We have to assume a written license was obtained, while leaving the evaluation license anyway. Maybe Monotype requires the eval license to ship with the fonts? Still I feel like I have opened the hood of a car and found foam packing material that was meant to be removed. # File must be less than 2K bytes for security reasons! What happens if the file grows larger? I found a few network scripts yet none that offered firewall or service port options. “STATIC_IP=192.168.57.99” shows up in a template while “STATIC_IP=192.168.6.1” is in a shell script. A peek into /usr/share/scripts/update/installer will bring you to a compiled “system_module_check.lua” file that the car trusts to help prevent the wrong update being used. Is Chrysler ok with people editing/improving the files and delivering their own patch to the Jeep community (as already may be happening), to encourage after-market service and support options? Could we reasonably expect independent auto mechanics to also fix code? I found this five-step process of getting a patch unnecessarily complicated. A download link should not be so obscure to find and incompatible with the latest/safest browsers. Also I found the patch strangely lacking integrity protections. And so you may want to consider the details of this patching process and have a closer look in order to help friends and family update their software and stay safe. To be clear I am a huge fan of refactoring and breaking down systems. I obviously a proponent because it is what I do for a living. Dismantling systems of bias or ineffective control is desirable not least of all because justice. When looking into Airbnb I would love to find that thread of social justice. Instead I find a troubling lack of transparency coupled with an ostentatious, even oligarchical, attitude. Airbnb has been grabbing headlines as venture vultures circle and smell profit. On the ground I hear and read about an unapologetic startup, blithely rejecting social protections to foment revolution. Straight to the point, progress is what we all are after. Progress should not have to be with the wrong partner, where values fall out of line with our own. Reform runs the risk of being get-rich quick scheme, built by and for the reformers, because that alone motivates some for reform. For others we have to ask why aspire only for self-enrichment, especially where clearly there is harm to others? It is a complicated topic of ethics, for sure, which needs investigation. That is why I say Airbnb begs the question of whether we can celebrate a software company in the hospitality industry for having a clue about the value of security and privacy. Sometimes people tell me Airbnb has no property or rooms that they “own” in the same way that Uber has no drivers and no cars. However Uber fires drivers and takes back cars on lease. Take a moment to think about this dissonance. Uber can fire drivers it doesn’t hire and take back cars it doesn’t own; so with all the power and none of the risk how exactly does Uber get hailed (no pun intended) as driverless and carless? Can Airbnb achieve the same dissonance? This is where we must seek answers to ownership carefully; do security and privacy of owning a property have to be lost to achieve the progress that benefits the funders of Airbnb? Perhaps it helps to look at the example of radio, a decades old sharing economy of music. Record companies through radio built a platform for sharing that kept musicians at arms length. Early on there are abundant sad examples of those musicians being abused by platform managers. Perhaps historic lessons here are to be minded? For Airbnb let us say you believe you have protection against unlawful searches of “your” property. You then allow Airbnb monitoring of “your” property and allow your private information to be stored and shared at their sole discretion. Is it still your property when you grant anonymous others control over its fate? I am working through these sorts of Airbnb risk scenarios from three levels of analysis. First, I used Airbnb twice (or more) and had totally surprisingly horrible experiences (e.g. six people head-to-feet crammed onto cots in a small low-income room, with apparently no money going to the organizations subsidizing the room); versus being a non-Airbnb guest around the world for decades. Second I have talked with neighbors about their hosting habits and problems they have faced; versus my non-Airbnb hosting for decades. Some Australian customers using Airbnb are worried about their privacy being breached, with the company confirming it shares people’s personal information for “marketing purposes”. In order to test whether fears are well founded, and to challenge my conclusions, I have taken a deeper dive. I searched for evidence of things going right at Airbnb, signs of customer security and privacy. Airbnb recently released two sections of policy, one after the other, to notify customers of major changes. Although having both is great to compare, the format they chose does not instill any confidence that they want you to see what exactly changed. It is not what I would consider reasonable disclosure, although it is better than no comparison at all. A software company claiming to be a leader easily could offer a markup option/view. I have created below the diff that I would like to have seen Airbnb publish, hopefully making it clear how much has changed. Hint: section 12 gives “sole discretion” to Airbnb to decide whether your property data can be considered exclusively theirs to disclose to law enforcement. We will use commercially reasonable efforts to notify users about law enforcement requests for their data unless we, in our sole discretion, believe harm or fraud could be directed to Airbnb, its Members, the Platform, or Services. And what methods are used to prevent abuse of sole discretion over your property data? How should a property data ownership model work with a company seen as having no ownership while retaining sole discretion over your property? …we may share your information, including personally identifiable information, in order to (i) protect or defend the legal rights or property of Pandora, or the legal rights of our business partners, employees, agents, and contractors (including enforcement of our agreements); (ii) protect the safety and security of Pandora users or members of the public including acting in urgent circumstances; (iii) protect against fraud or to conduct risk management; or (iv) comply with the law, legal process, or legal requests. Additionally, we may share your data, including any personally identifiable information, with our successor in interest in the event of a corporate reorganization, merger, or sale of all or substantially all of our assets. Airbnb (hereinafter referred to as “Airbnb”, “we”, “us” or “our”) operates a platform and community marketplace that helps people form lasting offline experiences and relationships directly with one another, where they can create, list, discover and book unique accommodations around the world, whether through our website or our mobile applications (“Platform”). Airbnb refers to Airbnb Inc. if you reside in the USA, and to Airbnb Ireland if you reside outside of the USA. “Aggregated informationInformation” means information about all of our users or specific groups or categories of users that we combine together and which does not include the users’ Personal Informationso that it no longer identifies or references an individual user. WHAT TYPES OF INFORMATION DOES AIRBNB GATHER ABOUT ITS USERS? We may also receive, store and process Log Data, which is information that is automatically recorded by our servers whenever you access or use the Platform, regardless of whether you are registered with Airbnb or logged in to your Airbnb account, such as your IP Address, the date and time you access or use the Platform, the hardware and software you are using, referring and exit pages and URLs, the number of clicks, pages viewed and the order of those pages, and the amount of time spent on particular pages. While you may disable the usage of cookies through your browser settings, we do not change our practices in response to a “Do Not Track” signal in the HTTP header from your browser or mobile application. We track your activities if you click on advertisements for Airbnb services on third party platforms such as search engines and social networks, and may use analytics to track what you do in response to those advertisements. 7.	to comply with our legal obligations, resolve any disputes that we may have with any of our users, and enforce our agreements with third parties. We may, either directly or through third party companies and individuals we engage to provide services to us, review, scan, or analyze your communications with other users exchanged via the Platform for fraud prevention, risk assessment, regulatory compliance, investigation, product development, research and customer support purposes. For example, as part of our fraud prevention efforts, the Platform may scan and analyze messages to mask contact information and references to other websites. This helps to prevent fraudulent actors from asking Guests to send them money outside of the Platform, such as by bank transfer or other money transfer methods. We may also scan, review or analyze messages for research and product development purposes to help make search, booking and user communications more efficient and effective, as well as to debug, improve and expand product offerings. We will not review, scan, or analyze your communications for sending third party marketing messages to you. We will also not sell these reviews or analyses of communications to third parties. We will also use automated methods to carry out these reviews or analyses where reasonably possible. However, from time to time we may have to manually review some communications. By using the Platform, you consent that Airbnb, in its sole discretion, may, either directly or through third party companies and individuals we engage to provide services to us, review, scan, analyze, and store your communications, whether done manually or through automated means. If you are located in the EEA or in Switzerland, please also see our Safe Harbor Notice (http://www.airbnb.com/terms/safe_harbor_notice). 1. Parts of your public profile page that contain some Personal Information may be displayed in other parts of the Platform to other users for marketing purposes. or to the extent necessary to operate and manage referral and rewards programs. 2. Your public Listing page will always include some minimum information such as the city and neighborhood where the Accommodation is located, your listing description, your calendar availability, your public profile photo and your responsiveness in replying to Guests’ queries. Your public Listing page may also include aggregated demand information (such as number of page views over a period of time). Parts of your public Listing page may be displayed in other parts of the Platform to other users for marketing purposes. The Platform may also display the Accommodation’s approximate geographic location on a map, such that a user can see the general area of the Accommodation. 3. The Platform allows your public profile and public Listing pages to be included in search engines, in which case your public profile and public Listing pages will be indexed by search engines and may be published as search results. This option is enabled by default, and you may opt out of this feature by changing your settings on the Platform. If you change your settings or the information on your public profile or public Listing pages, third-party search engines may not update their databases quickly or at all. We do not control the practices of third-party search engines, and they may use caches containing outdated information, including any information indexed by the search engine before you change your settings or the information on your public profile or public Listing pages. 4. When you submit a request to book an Accommodation, your full name will become visible to the Host. In addition, if you agree to be contacted by the Host by phone when submitting your request and the Host decides to do so, Airbnb will call your phone number first, before connecting you with the Host. We will not share your phone number unless there is a confirmed booking. ; if there is a confirmed booking, your phone number will become visible to the Host/Guest, who may call you directly. 5. When your request to book an Accommodation is accepted by the Host or when you accept a Guest’s request to book your Accommodation, we will disclose some of your Personal Information to the Host or Guest. However, your billing and payout information will never be shared with another user. 6. When a Guest stays at your Accommodation or when you stay at a Host’s Accommodation, we will ask you to review the Guest or the Accommodation. If you choose to provide a review, your review may be public on the Platform. The publication and display of information that you provide to Airbnb through this linkage is subject to your settings and authorizations on the Platform and the third party site. 8. We may distribute parts of the Platform (including your Listing) for display on sites operated by Airbnb’s business partners and affiliates, using technologies such as HTML widgets. If and when your Listings are displayed on a partner’s site, information from your public profile page may also be displayed. 10. We may also engage third party companies and individuals, who may be located outside of the EEA, to provide services to us, including but not limited to technology services and services to help verify your identification or, to conduct checks against databases such as public government databases (where legally allowed), to otherwise assist us with fraud prevention and risk assessment, to assist us with customer service, and to facilitate the payments or reimbursements you request (such as Concur and American Express). We may provide Personal Information about you to these third parties, or give them access to this Personal Information, for the limited purpose of allowing them to provide these services. We will ensure that such third parties have contractual obligations to protect this Personal Information and to not use it for unrelated purposes. 11. For any jurisdiction in which we facilitate the Collection and Remittance of Taxes or Opt-in for Host Remittance of Taxes as described in the “Taxes” section of the Terms of Service, Hosts and Guests expressly grant us permission, without further notice, to store, transfer and disclose data and other information relating to them or to their Transactions, Bookings, Accommodations and Occupancy Taxes, including, but not limited to, personally identifiable information such as Host or Guest’s name, listing addresses, transaction dates and amounts, tax identification number(s), the amount of taxes received by Hosts from Guests, or allegedly due, contact information and similar information, to the relevant Tax Authority. based on information supplied by law enforcement, we, in our sole discretion, believe: (a) that providing notice could create a risk of injury or death to an individual or group of individuals, (b) that the case involves potential harm to minors, or (c) that harm or fraud could be directed to Airbnb, its Members, the Platform, or Services. You may review, update, correct or delete the Personal Information in your Airbnb account by logging in to your account.. If you would like to correct your information or cancel your Airbnb account entirely, you can do so by logging in to your account. Please also note that any reviews, forum postings and similar materials posted by you may continue to be publicly available on the Platform in association with your first name, even after your Airbnb account is cancelled. We have implemented reasonableare continuously implementing and updating administrative, technical, and physical security measures to help protect your Personal Information against the unauthorized access, destruction or alteration of your information. However, no method of transmission over the Internet, and no method of storing electronic information, can be 100% secure. So, we cannot guarantee the absolute security of your transmissions to us and of your Personal Information that we store. The Platform provides a referral service that allows you to invite your friends and contacts to use the Platform. The Platform also allows you to ask your friends and contacts to write a reference for you, to be published on your Airbnb profile. We may integrate the Platform with third party sites such as Facebook, so that you can send invitation messages or requests for references via the third party site itself. These messages will be sent by the third party site, and Airbnb does not collect or retain the contact information that is used to send them. You may also send invitation/request emails via the Platform itself, in which case we will ask you for the email addressescontact information to which to send these emails to.your invitation/request. You can type in the email addresses or other contact information manually, or you can request Airbnbchoose to import the contacts in your email account address book(s). In both cases, we willmay use theand store this information sent to us for the sole purposepurposes of sendingallowing you to send your friends and contacts a one-time email, inviting him or her to visit the Platforman invitation or to writerequest for a reference for you, and for fraud detection and prevention. With respect to referrals, we will also store the email addresses of your invitees to track if your friend joins Airbnb in response to your referral. If you are allowed to join Airbnb’s Affiliate Program (see http://www.airbnb.com/affiliates) and you sign up for it, you will have to provide us with certain Personal Information to enable us to provide the Affiliate Program to you. If you organize a Meetup or indicate that you will attend one, this information, together with some of your public information (such as your profile picture and public profile page) and any messages that you post about that Meetup, will be visible to users who browse the event. However, Airbnb will never disclose where you are staying to another meetup user. The Platform may allow registered account holders to participate in online discussion forums (“Group(s)”) in selected cities. If you reside in the EU or Japan, you may request in writing copies of your Personal Information held by us. We will provide you with a copy of the Personal Information held by us as soon as practicable and in any event not more than 40 days after thereceiving a valid request in writing. There may be a charge to access your personal data (which will not exceed €6.35 in Ireland and £10 in the United Kingdom). We may also request proof of identification to verify your access request. All requests should be addressed to our Data Protection Compliance Officer, Airbnb Ireland, Watermarque Building, South Lotts Road, Ringsend, Dublin 4, Ireland. You may also request the erasure of your personal data if you believe we are otherwise in breach of relevant data protection legislation. All requests should be addressed to our Data Protection Compliance Officer, Airbnb Ireland, Watermarque Building, South Lotts Road, Ringsend, Dublin 4, Ireland. There is no charge for making such a request. Airbnb uses “cookies” in conjunction with the Platform to obtain information. A cookie is a small data file that is transferred to your device (e.g., your phone or your computer) for record-keeping purposes. For example, a cookie could allow the Platform to recognize your browser, while another could store your preferences and other information. In addition, Facebook places a cookie via the Platform that allows Facebook to obtain aggregated, non-Personal Information to optimize their services. For example, if a user clicks on an advertisement for the Airbnb mobile app on Facebook and subsequently installs the app, this cookie will inform Facebook that a user (who is not personally identified) has installed the app after clicking on the advertisement. This cookie may also inform Facebook that a user is using the app, without identifying the specific actions taken by the user in the app.